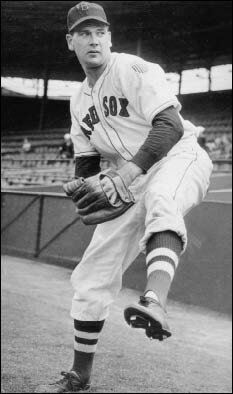 ON THIS DATE (August 26, 1945) ... Red Sox pitcher Boo Ferriss won his 20th game, beating the Philadelphia A's, 4-3, and doubled home the game-winner in the 10th inning. It was the debut of Dorchester sandlot star, Byron "Whizzer" LaForest, who raked Athletic pitching for five hits including two home runs and fielded his third base position beautifully. LaForest's last home run bounced off the right field wall into the stands to give Ferriss a two-all tie in the last of the ninth inning scoring Eddie Lake, who had walked. Ferriss capped the comeback by driving a double to center field in the 10th inning scoring George Metkovich from second base and locking up his 20th win of the season.